Blowout Sale! Save 56% on the LED String Lights,Battery Powered Multi Color Changing String Lights with Remote,50 LEDs Indoor Decorative Silver Wire Lights for Bedroom,Patio,Outdoor Garden,Stroller,Christmas Tree 16ft, 2 Packs by Kohree at Two Clock. MPN: HP407-HM. Hurry! Limited time offer. Offer valid only while supplies last. 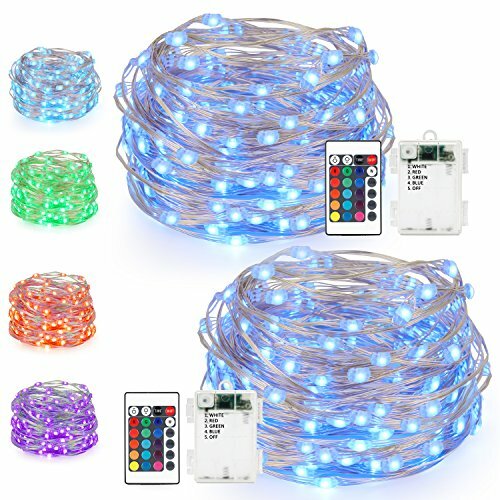 20 Feet 50 LEDs Multi-color Battery String Lights 16 colors options, tough, bendable, versatile, invisible, waterproof, handy, durable. 【Multi-Color LED String lights】16 individual colors,One solid color steady on,Multi color gently fade or joyful jump is all to your taste. 【24Key Remote Control with timer function and brightness level control】 Easy to control and energy efficient enough,Just one press will get your favorite color and light mode. 【Unprecedented quality】 each strand of kohree string lights are made of 4 high quality silver wire,sturdy,waterproof,insulated,It won't get overheat even after long hours' use. 【Be creative】 It needn't to be plugged in,placement is unlimited,flexible with a good quality,can be wrapped around almost everything,stairs,fence,patio,garden,room,vase,and even mental railings. 【IP44 waterproof battery case and waterproof insulated silver wire】Perfect for outdoor use,It will light up your house and cheer up your party inspite of lighting and rain.